One of the tensions of being a Pastor and an avid (borderline rabid) NFL fan comes down to a certain day of the week. A day which serves as an intersection between my passion, calling and responsibilities; one day a week that only presents a conflict in the months from September to February. That day is Sunday, Sunday, SUNDAY! Football and chur, uhhh, I mean church and football. I wish I could say that I was 100% spiritual all the time and while I sit in church services I am always taking sermon notes on my iPhone on the front row and never checking football scores on the NFL app. Now don’t get me wrong, I will never consistently choose a football game over my passion for building God’s house and His people. The local church far outweighs any other passion I may have. But there are moments where I do feel the pull of the pigskin. One of those moments came several weeks ago during the NFC Championship game between the Green Bay Packers and my beloved Seattle Seahawks. What a game. For nearly 56 minutes, the Packers had dominated my team. Everyone had given up on them, myself included. There were more mistakes, interceptions and fumbles from our team in this one game than in the eight games leading up to this one. And while the rest of the world (and let’s be honest, most Seahawk fans) had figured this was the end of a great season, the only ones who hadn’t given up were the Seahawks themselves; and then suddenly it turned. Comeback doesn’t even begin to describe what happened; miracle is more apropos. In three and half minutes, the Seattle offense came roaring back and forced Green Bay into overtime. It was at this point that my pastor hat came back on and I was forced (so dramatic) to leave my home, and my team’s future, behind as I jumped on a subway to make to our evening Union Square church service. Despite their inconsistency for a majority of the football game, the Seahawks never threw in the towel. Even in Seattle, fans had exited the stadium with 5 minutes left in the game, only to kick themselves afterward upon hearing the swing in fortunes. Can you imagine the heartache to be a believer, walk out on your team and find out later that you missed out on the comeback? As a leader, I wonder if you’ve ever been tempted to throw in the towel on people you’re leading. It’s easy to consider that option. Sometimes there are missteps and failures. Sometimes our team members drop the ball. Sometimes it feels like you have invested your life into someone and they come up short…again. I’ve been on both sides of the coin. There have been many times where I’ve made mistakes and costly errors but in the end I had people in my life that didn’t walk out on me with five minutes left in regulation. The ability to consistently believe in people and keep a short memory are critical to leaders who build leaders that go the distance. Learn how to focus on people’s potential. Teams/people that are encouraged regularly will often be inspired to go above and beyond. Have you had people in your life that believed in you even in difficult times? How did you respond as a result of their influence? I remember the day I stepped fully into leadership for the first time. It wasn’t as if I hadn’t had opportunities to lead or influence decisions before, but that day was different. That day someone had entrusted me with a fledgling initiative, a small group of people to lead and to care for on my own. I was handed the opportunity to birth a youth ministry at a church in Los Angeles. I found out quickly that service programming, events and organizational structure were not a great foundation to build on. Those things only survive on the back of strong culture and values and so I set out to engineer and pioneer culture and values. Little by little we began to attract more people, both students and leaders. As the youth ministry grew I discovered that I would be unable to perform every function needed to pull off a weekly services, pastoral care and the administration that supported it. I found myself preparing every week’s sermon, setting up and tearing down the event, praying with students, going to athletic events, meeting with parents, leading worship, doing expense reports, managing a website, launching a video channel on YouTube…you get the idea. It was too much and I was not only losing my personal steam, I was stunting the growth of the ministry that my soul was carrying. Suddenly I had an epiphany, I should have other people do this with me. Now, the idea of “never going alone” in leadership is one of the most basic ones and in one way or the other every leader figures out that no matter how gifted we think we are, we are unable to do everything. I needed people to partner with me in building and over time I was faced with two options when it came to the way I would lead people. It was either lease or release; that is, delegate or empower. On the surface the two ideas (delegation and empowerment) don’t seem to conflict. In fact many would say they are the same concept: people come along side of you and go accomplish your vision. And while the busyness of others looks like teamwork from the outside, only one of the two methods of leading others really produces a long-term success for the team and for the individual. In my experience the better answer is not delegation. 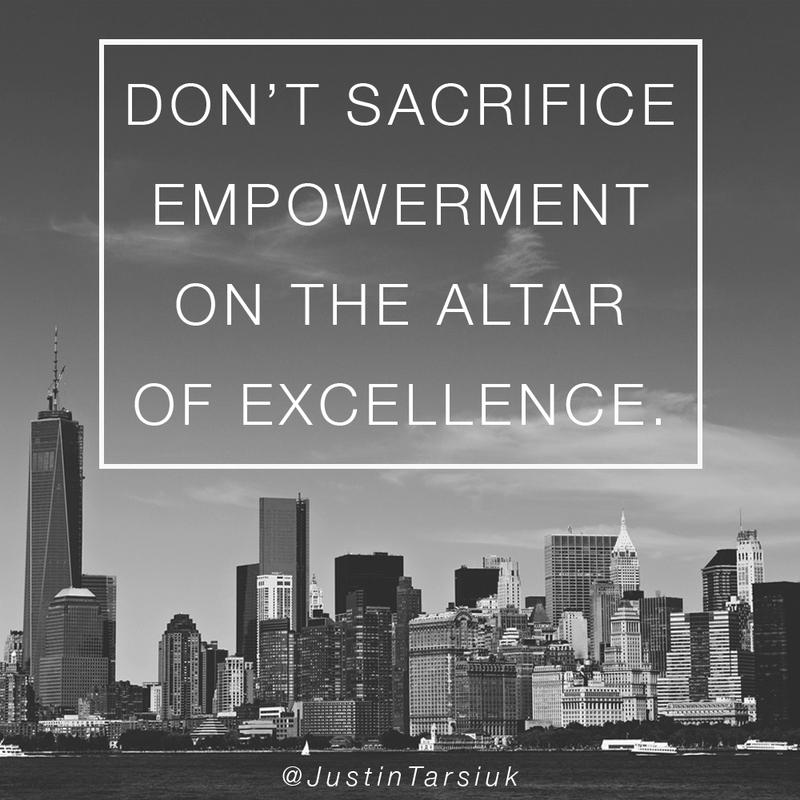 I’d like to offer 5 ways I believe empowerment is more effective than delegation. We’ll take a look at two of them in Part One of this post. 1.) Empowerment asks why; delegation says how. One of the teams in our Brooklyn church community is responsible every Sunday for setting up The Lounge. Essentially it’s our version of a church foyer where people can connect with friends over coffee and light snacks, find information about upcoming events at the church and meet new people. Prior to our lounge opening 30 minutes before the service, some set up needs to happen. Before set up can happen, some thought went into the design of the lounge. But even before the how can happen, there is a why. As a leader I have an important choice to make. Either I can tell a team how and where to set everything up, or I can teach why we have a lounge in the first place. Delegation gives people a list of executable tasks and usually a precise way of doing them. Empowerment believes that understanding the reason behind the task is more important. If I can effectively impart the values and vision behind why we need a comfortable place where people can develop genuine friendships then I can release a team to brainstorm and execute the best way to make that vision happen. Their ideas may be better than mine. But having the best ideas isn’t what defines leadership. It’s the leader’s job to release the best idea – in many cases, the one that doesn’t come from you. Case in point, that’s exactly what happened in our lounge in Brooklyn recently. One of the unique challenges we get to solve every week is the venue in which we meet. We gather in a movie theater and our lounge is at the bottom of an escalator, on the bottom floor. It’s an incredible effort but the whole space is transformed into God’s House every week (I’m pretty convinced that the Holy Spirit plays the largest role in that). But for a season, we were having a difficult time creating a hospitable first impression beyond the greeters at the front door. Some of the space our lounge occupied was unused and had some tables and displays positioned around it. We found that it was hard connecting visitors and guests at the moment of stepping off the escalator. Instead of me trying to come up with the best solution, I simply asked the team to find the best way to utilize the space in the most welcoming way possible at the bottom of the escalator and then I said, “Surprise me”. The team delivered and produced a collective result better than anything I could have dreamed up (you can come visit and see – we’d love to have you) and everyone won; our church family, our guests, our teams and our leaders who realized that the why can be accomplished by a number of different hows. This may a simple example of empowerment, but when you implement this kind of culture and reinforce it over time it begins to produce leaders who can dream and strategize on their own, all while reinforcing the values that drive you. 2.) Empowerment trusts; delegation tasks. When leaders step into a position where they have the final say, it’s very tempting to run point on every detail and project. This is partly because of a newfound freedom but mostly because we have a certain level of success or a specific eye for seeing things, which is why we were entrusted in the first place. We naturally lean toward the thought that initiatives should have our direct influence in every way. I would suggest you run from that impulse as quickly as you can otherwise you will find yourself delegating. As I stated earlier, a delegating leader will have specific instructions for completing something a precise way leaving no room for a person to include their unique fingerprint in the execution. And because there is no room for diversified leadership and individual problem solving among teams, delegating leaders tend to be the “go to” person for every single decision. Empowering leaders on the other hand bring their people into the brainstorm process and in the development of strategy allow their teams to run point. This style of leadership takes an enormous amount of time and energy – but trust always does. There is a process of building rapport, training judgment (or “critical eye”) and asking a lot of questions to help you understand the way your team leads think. The empowering leader will spend a lot of time outside of the actual event and work toward relationships with key team members and then we can trust them to execute the vision and values in any way they deem necessary. This kind of releasing inspires people, grows their personal capacity and truly shows a level of trust in their abilities and unique skill sets. If you want something done your way – and fast, then delegate. You may achieve short-term satisfaction, but you’ll find yourself having to own everything all the time. However if you want someone who can advance your vision and values over and over on their own, then take the time to empower. Giving away control could result in immediate outcomes less than you desired, but in the long run you build leaders that think for themselves, and then soon enough they will begin to think like you. I currently pastor/lead a church community in New York City and often I tell our teams that I strongly dislike the word delegation. Delegation carries the illusion of building people, but in the end their value or potential isn’t ever addressed. Delegation may accomplish tasks, but I’m not in the business of simply finishing tasks; I’m here to build people, to build Kingdom. Empowerment is a selfless style because it releases people to personally grow in their potential not just learn one way of doing things. Of course “stuff” needs to get done but I am more concerned about challenging someone’s capacity while we complete projects together. This is the essence of good leadership and empowerment should be the approach we choose. While there are many strategies and personalities in leadership that will affect the way in which a leader leads it’s the way we see people that ultimately allows us to create an environment where they truly flourish and reproduce themselves. Next week I’ll address three other ways that I think empowerment is a better approach than delegation. Until then, what are some other differences you see between delegation and empowerment? Is it just semantics? Feel free to comment; I’d love to hear your thoughts.